Starz’s Alternate Worlds Spy Thriller Counterpart Returns! At the Office of Interchange, those who have high enough access, safeguard a crossing into a parallel dimension not unlike our own. And if their world is like ours, who are we over there? Are we better? Are we different? Season two of Counterpart – premiering on Sunday, December 9th (10/9C) – finds Howard and Howard Alpha stranded in each other’s world. Now they get to live out the answers to those questions. No Activity Gets Cocky In Season 2 Trailer! Despite never actually doing anything, Detective Judd Tolbeck is under suspicion of corruption in season two of No Activity – CBS All Access’ police anti-action series. Guest stars joining the show this season include Jessica Alba, Chris Gethard, Max Greenfield, Joe Manganiello, Cristin Milioti and Nasim Pedrad, among others. No Activity: Season Two premieres on Thursday, November 22nd. The redband equivalent trailer follows. Counterpart Season Two Adds Get Out’s Betty Gabriel, Begins Production! Counterpart – Howard silk (J.K. Simmons), Aldrich (Ulrich Thomsen) and Howard silk (J.K. Simmons) – Photo courtesy of Starz. Starz’s original spy thriller/parallel Earth series Counterpart (Sundays, has begun production on season two in Berlin – and added Get Out actor Betty Gabriel as Naya Temple – a recent addition to the Office of Interchange from the FBI. On Counterpart, When Howard Silk discovers that his organization safeguards the secret of a crossing into a parallel dimension, he is thrust into a shadow world of intrigue, danger, and double-cross… where the only man he can trust is his near-identical counterpart from this parallel world. Starz Sets Sneak Peak for Counterpart! Starz has released a featurette in which series creator Justin Marks, Simmons and Nicholas Pinnock talk about the show. Counterpart premieres on Starz on Sunday, January 21st, 2018 (9/8C). The network will sneak peak the series premiere following the third season finale of Outlander. When You Walk Through That Door Trailer: Counterpart! Counterpart – Howard Silk (J.K. Simmons), Aldritch (Ulrich Thomsen) and Howard Silk (J.K. Simmons) – Photo courtesy of Starz. Howard Silk is not having a good day. He’s just discovered – in the most devastating way – that the he works in a building that houses a door to another Earth. Counterpart premieres on Starz on Sunday, January 21, 2018. Production Begun On Starz Drama Counterpart! A lowly cog in a bureaucratic agency, discovers that the agency he works for is really guarding a crossing into a parallel dimension (of course there’s much more to it than that…). In a nutshell, that’s the basic premise for Starz’s new drama series, Counterpart. Production on the series – which stars Oscar®-winner J.K. Simmons, Olivia Williams and Harry Lloyd – is underway. Mortyn Tyldum (The Imitation Game, Passengers) directed the first episode. A premiere date for the series is to be determined. For more, read on. Zack Snyder Tweets Justice League’s Bat-Signal and Commissioner Gordon! Zack Snyder is at it again. Today he tweeted a photo of the Justice League version of the Bat-Signal – and a shadowy first look at J.K. Simmons as Commissioner Gordon. Terminator Genisys – Close But No T-800! After the abysmal Terminator 3 and Terminator Salvation, I had virtually no expectations going into Terminator Genisys – it could hardly have been worse than those two movies, right? Well, right – but not by nearly enough to warrant a $170 million budget. 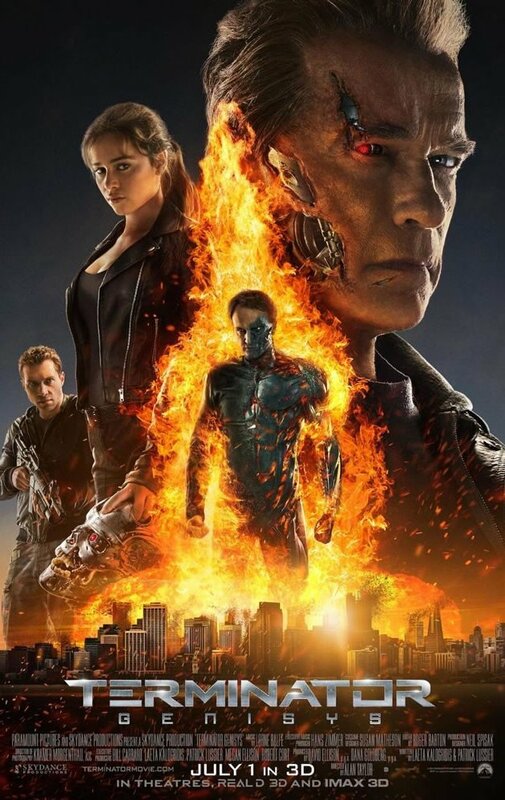 Even with Arnold back and some great performances ( by Emilia Clarke and Jason Clarke), Terminator Genisys falls short. Video: James Cameron Vouches For Terminator Genisys! Here’s an interesting concept: James Cameron has seen Terminator Genesys – and he really liked it! He liked it enough to make a video talking about it. In the video he addresses the way the film, while ‘being respectful of the first two films,’ goes its own direction. He mentions some of the big time spoilers that have already been given in the trailers and loved them. Check out his video after the jump. Terminstor Genisys opens July 1st.